When it comes to eating healthy, your slow cooker is one the best tools you’ve got — and probably underusing — in your kitchen. Slow cooking is one of the healthiest ways to cook meat. It brings out flavors and tenderizes meat so well it won’t matter what type of cut you throw in — even the less expensive ones! With your slow cooker you can create easy, hearty keto one-pot meals, stews and soups with all the nutrients and flavors locked in. This recipe will have you dusting off that slow cooker and putting it to good use from here on out! 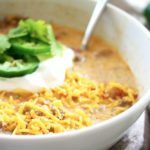 Comforting, crowd-pleasing taco soup is perfect for colder weather, busy days/nights at home or whenever your family or friends request it — and trust me, they will! This is quick to become a favorite and that’s okay because it’s so easy to make! Taco soup is particularly awesome for its abundance of spices: chili powder, red pepper flakes, oregano, paprika and cumin all benefit your health in various ways including red blood cell formation and increased cognitive function. The famous tomato debate: raw vs. cooked? Tomatoes are the major veggie — sorry, fruit — source of lycopene, the antioxidant linked to heart health and reduced risk of heart disease and cancer. Fun Fact: Lycopene content increases when tomatoes are cooked! In one study, tomatoes were cooked for 2, 15 and 30 minutes. Vitamin C went down by 10%, 15% and 29% respectively and beneficial trans-lycopene content went up by 54%, 171% and 164% respectively. So, this means you’d still want to incorporate raw tomatoes into your diet to obtain adequate vitamin intake — but, in terms of receiving the antioxidant benefits from lycopene, cook those tomatoes! In a large pan over medium heat, brown ground beef until fully cooked. Once cooked, drain grease. In the slow cooker, add beef, spices, cream cheese and diced tomatoes with green chiles. Stir to combine. Once combined, pour in beef broth and heavy cream. Stir well. Set slow cooker to low for 4 hours. Serve in bowls and top with desired garnishes. Why can’t I see this recipe anymore? Hi, our developers are working on site updates and fixing recipe issues. The recipes should be back tomorrow! Check back in a bit. Thank you! This might be the best thing I’ve ever eaten. I made and froze this and have had it for lunch and dinner everyday since. I changed it up a bit. Diced and seared pork tenderloin, more quantity of the spices and salt listed, then finished with a fresh squeeze lemon in the bowl along with avocado, sharp cheddar, cilantro and sliced olives. Holy CRAP YES!!!!!!! This recipe is outstanding. My whole family loved it. It’s a keeper. I made it exactly as stated. It is delicious. I may tweek it a little next time, but only for personal preference. There is no real need to change it.